Check your coins the week of April 21 to see if you can find one of the historic coins which are being circulated in the Sidney area. SIDNEY – Check your change! You may find historic and potentially valuable old money in your pocket and purse change. Hundreds of rare coin dealers and collectors across the country, including a few dozen members of the Shelby County Coin Club will be deliberately putting into circulation collectible coins, some nearly a century old. The “Great American Coin Hunt” (www.GreatAmericanCoinHunt.com) is one of the activities planned during the 96th annual National Coin Week (www.NationalCoinWeek.org), April 21-27, 2019. National Coin Week is sponsored by the nonprofit American Numismatic Association (www.money.org) to celebrate the historical, cultural, artistic and economic importance of money as well as the enjoyment of coin and paper money collecting, according to the National Coin Week coordinator Andy Dickes. “The designs, denominations and metallic content of coins tell us a great deal about civilizations, past and present, such as famous and not-so-famous political and historical figures, important events and landmarks,” said Jerry Tangeman, Shelby County Coin Club president. The Great American Coin Hunt initiative has grown out of the group Coin Dealers Helping Coin Dealers, which has more than 200 members nationwide that will be deliberately placing historic old coins and paper money into circulation to encourage people to closely look at their money. 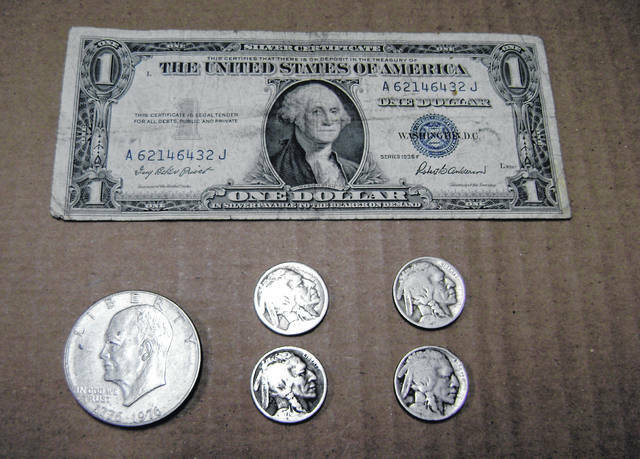 Among the items local club members will be spending as pocket change in the Shelby County area are silver certificates, Buffalo nickels and Eisenhower dollars. National Coin Week, observed every third week of April, was established in 1923 to attract the general public to the hobby of coin collecting. For additional information about National Coin Week, visit www.NationalCoinWeek.org.